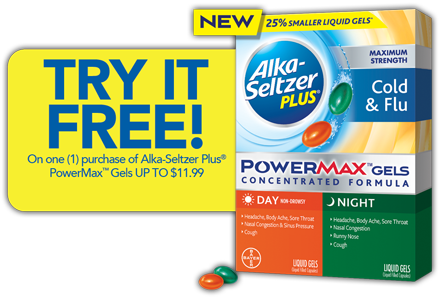 Get a FREE Alka-Seltzer Plus PowerMax Gels After Rebate! – Product must be purchased from 10/14/18 – 11/4/18. Submit your request with image of UPC and sales receipt to receive rebate check via mail. Open to residents of the 50 US & DC, 18+ (or 19+ for AL or NE). Void where prohibited. Valid on any 1 Alka-Seltzer Plus PowerMax Gel product purchased between 10/14/18-11/4/18. Submit your online rebate request by visiting rebate.alkaseltzerplus.com, which includes uploading UPC and receipt. Requests must be submitted by 11/18/18. Allow 8-10 weeks to process. Limit 1 Rebate per person/household. Only street and rural routes will be accepted.